I spent the weekend in a zen retreat. My zen master was in town to give a Christian Zen retreat. There were many raised eyebrows from Catholics. Zen? Christian? How? But to me, it is not an either or scenario. Zen is not a religion, rather a practice. I was introduced to Zen in December 2005. I was in tears and inconsolable. I hit a deep dark place I had never been before. There was no solace from the company of family or friends. One day, a goofy friend much like Kramer, invited to join him sit with a sangha. Somehow, zen seemed to work. I then, sat religiously every day, and once a week with a sangha. And, I got through that deep dark place, breath by breath, surprised to see wonderful results in other aspects of my life. But as I’ve moved to Singapore, I have been delinquent in my practice. While I attempt to sit alone, sitting with a sangha is profoundly powerful. This past weekend, with Sr. Sonia to my left and about a dozen other Catholics meditating, I was recharged. Sharing these thoughts with the group, one lady asked, “Does doing a lot of zen meditation make you more detached from reality?” I immediately knew the answer. “No, not at all!” The days I sit and meditate my senses are heightened. It then became crystal clear to me. 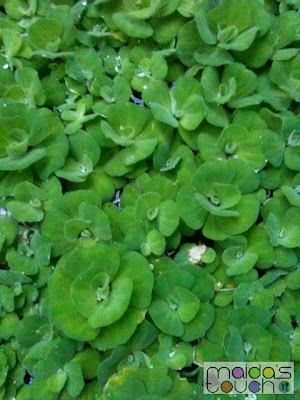 Zen meditation is like living in high definition. A heavy downpour often saddens me, but not this morning. I welcomed the coziness of the rain, and enjoyed its crisp, clean feeling. I watched as the rain fell on the puddles. As the raindrop hit the puddle, ripples were formed. It reminded me how interconnected we all are. Ones actions or sometimes inaction cascades into a ripple effect on others. We are one breath. For this food writer, eating in mindful silence heightened the flavors. I stared at how beautifully Sr. Sonia piled the garnish of egg, fried shallots and green onions on her rice porridge. I wished I had my camera. Such a simple breakfast, but the warm savory porridge satisfied immensely. The black pepper awakened my taste buds on this dreary day. The chewy pickled seaweed was a pleasant low intensity workout for my jaws. Chinese dessert soups never really appealed to me, not until this retreat. I wanted to break my silence at the morning snack break. They served a white murky soup, almost like birds nest soup. 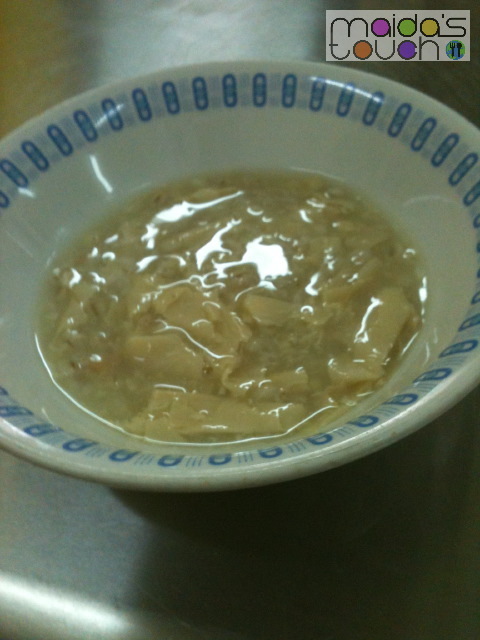 It was a sweet soup with barley, ginko nuts, tofu sheets, and egg. Fantastic! Served hot, the barley was chewy, yet somewhat refreshing. The red bean soup for afternoon snack was equally delicious. 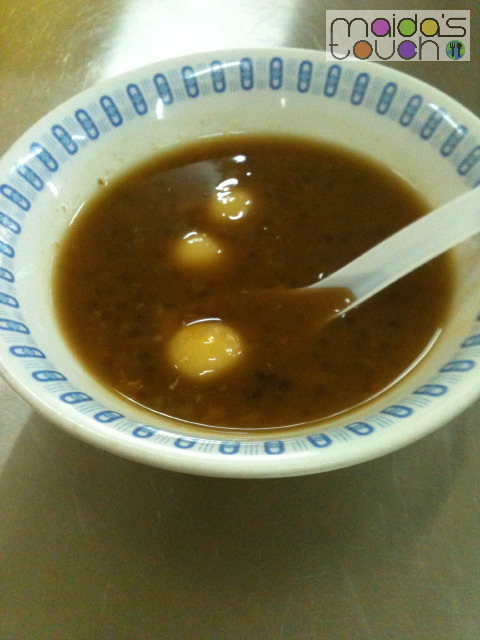 My favorite accent was the chewy glutinous rice balls floating in the soup. All the meals were vegetarian. Using vegetables, mushrooms, and tofu, the cook masterfully created a feast. 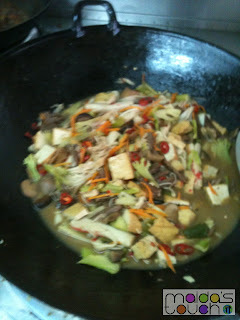 The showstopper of the meal was the xo sauce, with chili, onions, and ikan bilis (dried anchovies). The sauce adds that zing to the dishes. But zen not only awakened this foodie’s tastebuds, but also her heart. The woman who cooked the food for 40 people people for 3 meals and two snacks is Zeny. She is a very simple Filipina lady. When I asked the names of dishes, she didn’t know. She merely knew how to cook them. She studied how to make these recipes. In the evening after preparing all five meals, I saw her weary. She looked beyond tired. I knew that feeling. That’s exactly how I looked at 2am during a TV shoot, or a full day’s editorial food shoot. Despite being surrounded by food all day, you are hungry but too tired to eat. In Zeny, I saw myself. There was compassion. It was not her, or me, but we were one. The next morning, I watched the fish swim. 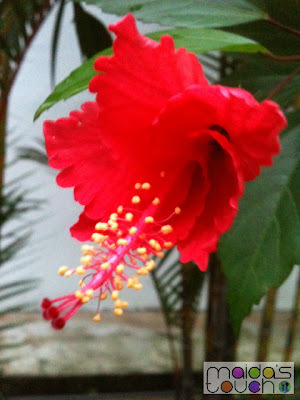 I saw the red hibiscus flower’s beauty, as if I head just seen it for the first time. I noticed how clever an old wooden wheel was turned into a garden chair. Everything seemed brighter, clearer and more beautiful. The details were more visible. Even at mass, even the priest made sense. The choir sounded wonderful. The songs were so apt. Even the communion song, “Be still and know that I am God” seemed handpicked for me. I pranced home light as a feather. There was a definite bounce to my step. I slept soundly. I awakened, even before sunrise. I was energized and not desperately craving caffeine to function. My only prayer now is to live in HD. May I experience life in high definition. It will happen breath by breath, and with the practice of sitting on my cushion each day.